Monk’s House of Ale Repute. A great beer bar in Sioux Falls, SD. 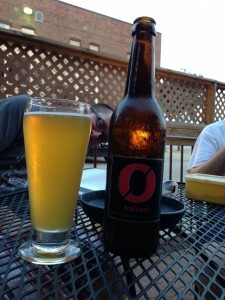 I visited Sioux Falls, South Dakota last week and checked out their beer scene. I grew up in Sioux Falls and went to college there, during a time when it was a beer desert. Nowadays, for homebrewers and craft beer lovers there, things are looking up. 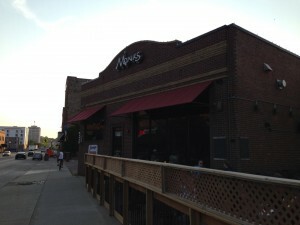 The best beer drinking part of Sioux Falls, in my opinion, is Monk’s House of Ale Repute, on 8th Street. This is a great little beer bar that has recently expanded. (They made Draft magazine’s list of best 100 beer bars in 2012.) As the name implies, Monk’s has a variety of Belgian beers, but they also have plenty of German beer and American craft ales. Since Sioux Falls is full of Scandinavian-Americans, there are Scandinavian brews such as Nøgne Ø and Haandbryggeriet as well. They have 29 beers on tap and over 200 in bottles. Monk’s also a favorite hangout for the Big Sioux Brewing Society, the local homebrew club. For homebrewers, things are looking up. A couple years ago, Taylor’s Pantry, at 41st and Minnesota — a gas station that has the best selection of beer in town — added a section on homebrewing. And just this year, a new shop — Steins and Vines — opened there. Overall, not too bad for a town in which Beck’s was an exotic beer not too long ago. Enjoying a Nøgne Ø Saison on the porch at Monk’s. Sioux Falls is a great city. My wife and I miss it a lot. Other than the cold climate I cannot imagine a better place to live and raise a family. It is a nice town. With all the recent growth, it’s starting to get some unique businesses (like Monk’s) and attractions so it’s not such a cookie-cutter Midwestern town anymore. Grew up there too. Would love to move back, just nothing in my field. Steins and Veins has been around longer than just this year! They got me started with my 1st home made batch of beer almost 3 years ago. And Taylor’s may have a good beer selection, but to say it has the best selection of beer in town is misleading. Many of the liqueur stores here have a great selection and more than happy to special order as needed. I don’t mean to be demeaning, but to say Sioux Falls is full of Scandinavian-American’s is also misleading towards Sioux Falls, and really just politically incorrect. The truth behind that statement is that the 1st settlers of South Dakota were of mostly German and Scandinavian ethnic backgrounds. But all that is our history, not current events. Thanks for the info on Steins and Vines. And yes, there are a lot of stores with a good beer selection in Sioux Falls and which is the best is a matter of opinion. Taylors always seems to have more Scandinavian and less-well-known Belgian beers when I go there, so I like it; but plenty of places (such as the Hy-Vee on Sycamore near my parents’ place) have a great craft beer selection. Agreed. I’m not quite sure how you found my description of Sioux Falls misleading or politically-incorrect. There are a substantial number of Scandinavian-Americans (particularly Norwegian-Americans) in town. I went to Augie and the mascot is a Viking (and also Augie Doggie). They hold (or held) a Nordland Fest there every year. I’m not saying there aren’t other ethnic groups, and certainly the town is much more diverse than when I grew up there, but there are a lot of people of Scandinavian descent in town. Of the two brew stores in town ( yes there are really only two) Steins and Vines I consider the Best choice. Very helpful and extremely knowledgable . Steins and Vines will make sure you have what you need for that special brew day. I used Taylor’s before I found Steins and Vines and still do in that rare case I can’t find what I need there. And the Monks experience is a must when visiting town. I wasn’t disagreeing with what you wrote. Just commented on how you wrote it. I did state that indeed the 1st settlers of South Dakota were of mostly German and Scandinavian ethnic backgrounds. I just feel the way you wrote what you said makes South Dakota is full of Scandinavian with duel citizenship to America. Perhaps misleading was to strong of a word. I just don’t like the phrase Fill-In-Blank-American, unless you have duel citizenship. I feel if you were born in America, you’re an American with a Fill-In-Blank heritage or ethic background. Just because your great great grandfather was from Scandinavian, doesn’t mean everything about you is of Scandinavian tradition, style, and taste. That you only drink Scandinavian style beer. I’m willing to bet, that most of the Scandinavian descendants wouldn’t be able to point out Scandinavian on a map if asked. On another comment. Yes, if you are a beer fan, Monks is a must if you ever visit Sioux Falls.